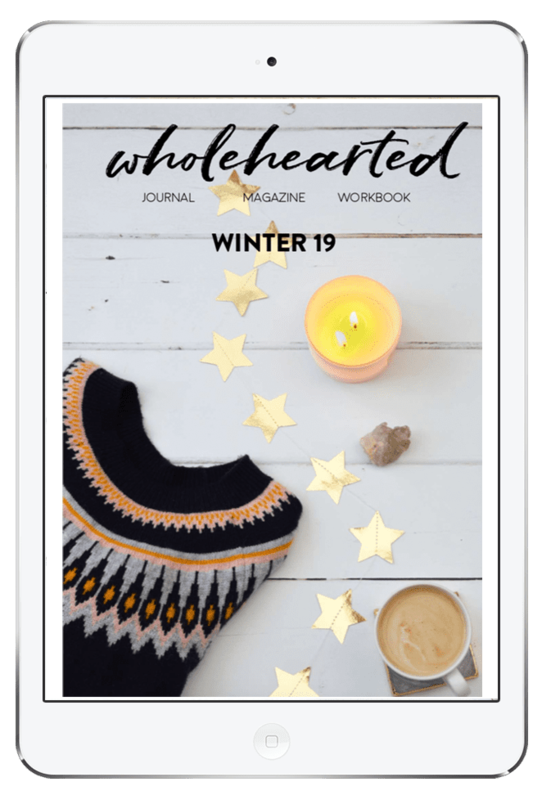 Not just a magazine, Wholehearted is a quarterly seasonal journal designed to inspire you through the season with a unique mix of articles, recipes, planners, workbooks and more. Set your intentions each quarter and then use the monthly sections to track your progress and make sure you’re living life conciously and not just by default! Setting intentions in 90 day bursts is scientifically proven to help you achieve more, the Wholehearted Journal helps you to do this in an inspiring and motivated way. Bring all aspects of your wellbeing together in one workbook. Inspiring articles, recipe ideas, spiritual tips for becoming more connected, habit trackers, calendars and more. Don’t get overwhelmed – use the Wholehearted Journal alone or in conjunction with another planner. Individual sections can be printed (or cut out of the in print version) and used on pin boards, stuck up on fridges, or inserted into other diaries and planners. 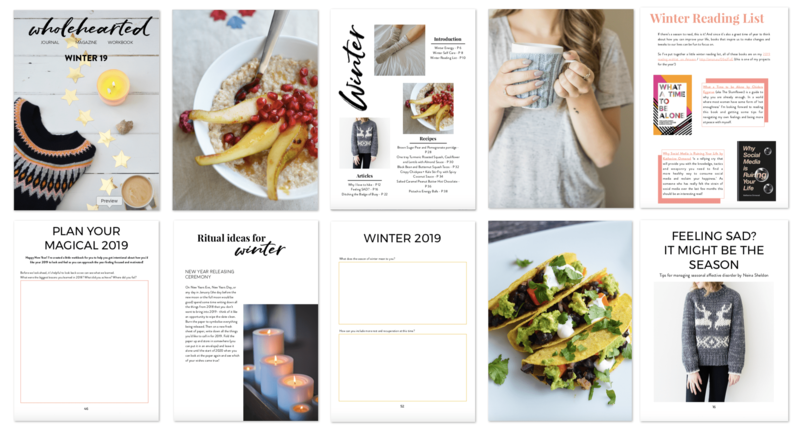 What’s inside the winter 2019 issue? We have a limited number of issues available in beautiful high quality matte print paper. This option means you can write straight into the journal, take it with you, keep it on your desk and use it wherever you like. You’ll also get a copy of the digital version immediately. Price includes postage and packing. See FAQ below for shipping details. Please note UK shipping only unless you contact me for international shipping rates. Price includes 1st Class Royal Mail Postage UK. The digital version is a filable PDF (so you can type straight into the document and save it). You can also print out sections as and when required, and view the journal on your phone, tablet or PC. Available globally. What happens when I click the Buy Now button? You’ll be taken to PayPal via my processor SendOwl to pay for your purchase. Upon payment you’ll be emailed a confirmation. If you’re purchasing the In Print edition, you will also recieve a seperate confirmation when your order has been shipped. The In Print version is only available to be shipped to UK addresses. Postage and Packaging is included in the price. All purchases will be posted 1st class within 2 working days of your order for in stock product. I live in the Southern Hemisphere, is this for me? Do you offer refunds if the journal isn’t for me? Unfortunately we do not offer refunds on this product.